Our favorite Christmas-themed entertainments have elaborate origin myths. It’s A Wonderful Life fell into the public domain and became so beloved because any station could show it for a pittance. A Charlie Brown Christmas was thrown together in a couple of months under a strict deadline. A Christmas Carol became Charles Dickens’ ticket from middle-class writer to literary superstar. And so on. These bits of myth that grow up around our favorite entertainments help embellish their cred as classics worthy of a time of year when believing in miracles becomes slightly more socially acceptable. Squint just hard enough, and the fact that all of these things are as good—and as prominent—as they are comes to have a sense of predestination. These rose above the millions of other pretenders because they were good, yes, but also because they were supposed to. The story of A Christmas Story is mostly just that it got played on TV a lot, and people liked it. Yeah, there have been attempts to embellish that legend a bit. There’s the story about how director Bob Clark decided to take the project on when he was driving around with a date and heard Jean Shepherd’s warm voice on the radio. (He didn’t get out of the car until the story was over; the date didn’t go so well after that.) There’s the bit about how the movie he made immediately before this one was Porky’s, which is always presented as an amusing bit of trivia. And there’s the fact that the movie didn’t make a ton of money upon its initial release, one week before Thanksgiving in 1983. It did well enough, but it didn’t arouse so much attention that it seemed like a potential classic in the making. Critics gave it middling-to-kind reviews but didn’t really laud it, and audiences went to see it but not in massive numbers. No, A Christmas Story got where it is because of TV, and it’s not hard to see why. The movie made its TV debut on HBO in 1985, then slowly made its way toward channels more people had, popping up on WGN and Fox on either Thanksgiving night or the night after Thanksgiving a few times before eventually making its way into the hands of the Ted Turner empire, where it was destined for great things. Even in the ’90s, TV ratings were beginning the long process of splitting into smaller and smaller niches, and networks of all shapes and sizes understood that one of the vital pieces of any year-round ratings puzzle were holiday specials. TNT and TBS bet big on A Christmas Story, showing it more often every year, until arriving at the day-long marathon on TBS that will air again this year beginning Tuesday night. The networks took a good movie that people had responded to and turned it into an event, even as NBC was limiting Wonderful Life airings to one or two per year. A Christmas Story became the de facto American Christmas movie and hasn’t looked back. 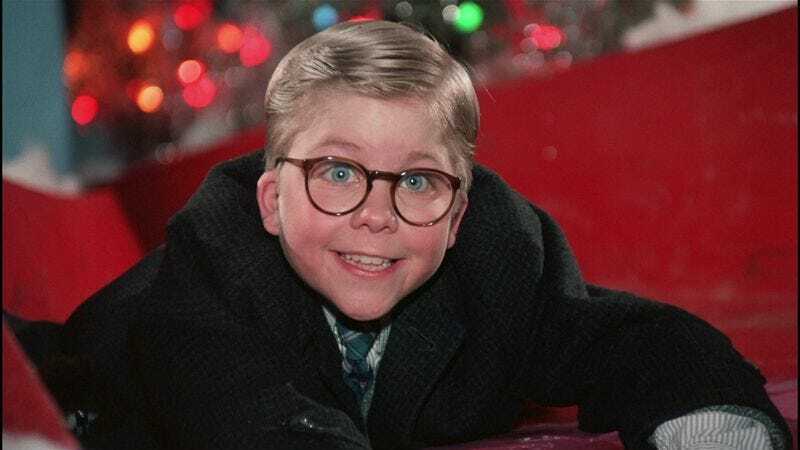 One thing that makes it easy to watch for 24 hours or just dip in and out of is also something that probably kept it from being a hit at the box office: A Christmas Story doesn’t have much of a plot. Sure, Ralphie Parker’s (Peter Billingsley) desire for a “Red Ryder BB gun with a compass in the stock and this thing which tells time” is the film’s one constant, the thing it keeps coming back to until he finally receives it on Christmas morning. But the film itself is simply a collection of vignettes, which are themselves often plotless. It’s episodic by its very nature, drawn from multiple Shepherd stories and anecdotes, so that there are occasional sequences that are more or less humorous observations about life at Christmastime. It’s somewhere between a Reader’s Digest “Life In These United States” column, a podcast from The Moth, and A Prairie Home Companion. That episodic structure also helps the film thrive on television. It doesn’t matter if you enter at its beginning, middle, or end. Because almost every scene or sequence tells an individual story and the one overriding constant is something understandable to damn near anyone (really wanting something for Christmas), the film becomes a kind of endless Moebius strip, an eternal December that can begin and end at any point but always returns to Ralphie peering in that store window and always concludes with the boy lying in bed, cradling his gun. Then it loops right back around to the beginning, to the warm, wonderful tones of Shepherd. It’s like living in one of those holiday window displays full-time, Christmas never-ending. There’s good reason that speaks so well to the American holiday psyche. By and large, A Christmas Story threads an incredibly difficult needle. It’s nostalgic both for a more universal childhood holiday, one full of longing for presents and negotiating bullies and writing down a Christmas wish list—things kids will probably always do as long as the holiday exists—and for a very specific kind of American holiday that’s mostly disappeared, one with local department stores and kids longing for BB guns and stay-at-home moms who leave red cabbage on the stove for days. It’s a film that’s vaguely diverse both for when it was filmed and when it’s set—notice several black people in the cast of extras—until you get to the part with the Chinese restaurant employees who can’t pronounce their L’s. It’s a weird mix of an America that had been and an America that was becoming, shot through with themes and story points universal enough for anybody to identify with. It’s completely accidental, but it’s an amazing bit of filmmaking alchemy. None of that would work without several elements, however. Clark’s direction is fine on a visual level, though he’s no great stylist. What really makes this work is the fact that he manages to juggle all of the film’s tones and always keep in mind that everything depicted here—even the stuff that Ralphie isn’t privy to—is imagined from the perspective of a child. (Oddly enough, this makes one of its closest cousins 1982’s E.T.) The film’s mix of voiceovers from Shepherd, fantasy sequences, and hyper-real depictions of Ralphie’s childhood as it “actually” happened feels like a distinct influence on The Wonder Years, which would make the movie an indirect influence on many of the single-camera comedies of the last 30 years. A Christmas Story could collapse under the weight of all these tonal shifts; that it doesn’t is credit to Clark. The true strength here, though, is in the Parker home, where both kids and parents are perfectly chosen. Billingsley does wonderful work as Ralphie, and Ian Petrella is a great find as younger brother Randy (his laugh should be a staple of any Christmas mixtape). But it’s the parents who anchor this film, both Darren McGavin as “The Old Man” and Melinda Dillon as “Ralphie’s Mother” perfectly finding the narrow space between a child’s simplistic understanding of what his parents might be up to and the reality of who these people probably are. The film’s perspective is a tricky one to figure out. On the one hand, it’s from Ralphie’s point of view, so he’s going to see everything from a childlike position of not understanding everything going on around him. On the other, it’s from the perspective of older Ralphie, looking back on his childhood, where he might have a better understanding of what his parents were up to. That McGavin and Dillon remain humane and understandable, while just a little mysterious, marks how they become the film’s true center. Nowhere is this better expressed than in the film’s subplot about the Old Man’s “major award,” the lamp shaped like a woman’s leg that he places in the front window, a lamp that his wife comes to despise. In the scene where Mom breaks the lamp, the two argue at length, and said argument is filled with all sorts of stifled resentments and things both of them perhaps wish they could say, but for the kids who are watching. And yet as filtered through young Ralphie’s point of view, the whole thing is just a touch mysterious, outside of the fact that it’s his mother and father yelling at each other. Then, filtered through grown Ralphie’s point-of-view, it becomes this weird nostalgic thing, a memory of something unpleasant that becomes pleasant because of the gauzy haze of nostalgia. The film is filled with these sorts of moments where emotions clash and quarrel, whether in the justly celebrated Santa sequence—which flies back and forth between out-and-out comedy (the kid in front of Ralphie who can only say he “likes” whatever comes along) and weird, kiddie horror (that booming, irritable Santa)—or the sequence in which Ralphie snaps and beats up Scut Farkus, which turns into a kind of reminder that childhood emotions can be overwhelming and frightening. Ralphie cries throughout the sequence because of a kind of terror—both at what his parents might do to him and at what he’s capable of. It’s that elemental connection to childhood feelings that keeps A Christmas Story fresh, I think. I would never call it a great film—it’s too amiable and purposeless for that, and I have a hard time imagining watching it in, say, July—which holds it apart from other Christmas classics like It’s A Wonderful Life and The Shop Around The Corner. But it is a personable film, and that’s perhaps even more impressive than achieving true greatness. It’s a movie that drags the viewer into Shepherd’s vision of an America eternally perched in December of 1940, between the close of the Great Depression and the start of World War II, filtered through Clark’s sensibilities, performed by an ace cast. That it’s able to do that while still leaving room for the viewer’s own nostalgia for Christmases long past is where its success lies. While A Christmas Story is never going to be my favorite Christmas film, it’s the Christmas movie I’d most want to live in. The movie’s Norman Rockwell America seems further and further away with every year—and that’s a good thing in a lot of ways. I’d rather live in the diversity-rich, progressive city I live in now than in a place that casually understood “American culture” to mean “things white people were up to.” But at the same time, I miss a world that I came in at the tail-end of—of downtown department stores and small towns that weren’t just bedroom communities for larger cities, of boisterous, copyright-flouting Christmas parades and two-story houses a family could live in on one income. I don’t actually want to live in that world, in that never-ending December, but, man, it’s a nice vacation to take for 24 hours every year, isn’t it?